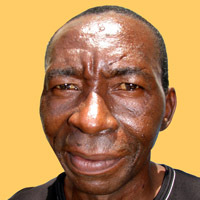 Noel Kapanda is maybe the least known Tingatinga painter in Dar es Salaam but he should be the best known. Many people doubt that he is the almost 30 year’s younger brother of Damian Msagula. A few know that he was the centre figure in painting the sculptures of George Lilanga. (see also www.lilanga.org ) Later it was established that he painted all (at least earlier) works of George Lilanga. (see the article Lilanga: The Fraud of the Millenium) His back fall depended the fact that his Japanese “sponsor” suddenly died and Noel Kapanda found himself “alone”. He was nevertheless invited to Japan 7 times, the first times with George Lilanga. Noel says that when the Japanese gave him a brush and colour he couldn´t paint anything. Since then he went to Japan without George Lilanga. Noel Kapanda was one of the first painters who entered the sister Jean´s Nyumba ya Sanaa. He was sent there by a Swedish teacher Ingrid Berlen whom I found after 27 years in Stockholm, Sweden. Noel Kapanda was born in Ndanda (South Tanzania) in 1964 as one of more than 10 children. In 1979 he moved to Dar es Salaam where he painted with Linda, Luka, Peter, Msagula and Haidi. As his first wife passed he remarried and has totally 4 children. Noel Kapanda paints the traditional Tingatinga and the life at the African villages. There he gained a very good skill. His paintings has an appeal.